The great prophet Jeremiah lived during the most crucial period of Judah's existence as a kingdom. He saw the destruction of Jerusalem and the holy Temple, after he had incessantly warned his people to mend their ways before it was too late. 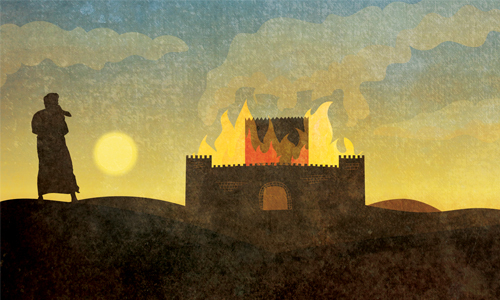 And when the catastrophe finally overwhelmed his people, he was the one who bitterly lamented Israel's terrible fate in the Book of Echah (Lamentations) which we read on Tisha B'Av, the anniversary of that catastrophe. At the same time, he proved to be a true friend in need, by helping his stricken people to bear the blow with courage and dignity, and by pointing out to them the path that would lead to restoration and redemption. Jeremiah was born of a priestly family, in the town of Anatoth in Benjamin. His father was the prophet and High-Priest Hilkiah. He began his prophecy during the time of the prophet Zephaniah and prophetess Huldah, in the thirteenth year of King Josiah's reign (3298). The destruction of the Northern Kingdom by the Assyrians was still fresh in the memory of the people of Judah, and we can imagine in what a state of spiritual agitation they were living at that time. Under these conditions, Jeremiah began his prophecies. One of his first missions was to go to the exiled ten tribes of Israel, to bring them courage and hope, and to induce many of them to return to their native land. Jeremiah witnessed the fall of the Assyrian Empire and the death of King Josiah. Though the people deeply mourned the death of their beloved King Josiah, the chief mourner was the prophet Jeremiah, for he knew very well that with the untimely passing of this last pious king, the end of Judea as an independent state was unavoidable. Indeed, after Josiah's death the people soon reverted to idolatry. Jeremiah was shocked by the new relapse of his people and strove hard to stem the tide of spiritual depravity which was threatening to undermine their high moral standards. Recalling Israel's earliest history as a nation, when, full of faith, the people had followed Moses into the desert, Jeremiah pictures Israel's loyalty to G‑d as that of a newly-wedded bride to her husband, and wonders what has happened to his people that they have turned away from G‑d. He sadly decries Israel's ingratitude and unfaithfulness and warns them that it spells their doom: "Thus saith the L-rd: I remember for thee the affection of thy youth, the love of thine espousals; how thou wentest after Me in the wilderness, in a land that was not sown. Israel is the L-rd's hallowed portion... all that devour him shall be held guilty; evil shall come upon them, saith the L-rd. Hear ye the word of the L-rd, O House of Jacob, and all the families of the House of Israel. Thus saith the L-rd; What unrighteousness have your fathers found in Me, that they are gone far from Me and have walked after things of naught, and are become naught?... And I brought you into a land of fruitful fields... but when ye entered, ye denied My land, and made My heritage an abomination... For My people have committed two evils. They have forsaken Me, the fountain of living waters, and hewed out cisterns, broken cisterns, that can hold no water... "Therefore... will I cause to cease from the cities of Judah, and from the streets of Jerusalem, the voice of gladness and the voice of joy, the voice of the bridegroom and the voice of the bride; for the land shall become a desert." One of the prophet's famous sayings is the one in which he points out that wisdom, might, and riches, are nothing compared to the happiness that man achieves through real knowledge and understanding of the ways of G‑d: "Thus saith the L-rd: Let not the wise man glory in his wisdom, neither let the mighty man glory in his might; let not the rich man glory in his riches. But let him that glorieth, glory in this, that he understandeth and knoweth Me, that I am the L-rd Who exercises mercy, justice, and righteousness on the earth; for in these things I delight, saith the L-rd." Of the futility of trusting in man instead of in G‑d, the prophet has this to say: "Thus saith the L-rd; Cursed is the man that trusteth in man, and maketh flesh his arm, and whose heart departeth from the L-rd. For he shall be like a tamarisk in the desert, and shall not see when good cometh... Blessed is the man that trusteth in the L-rd... for he shall be as a tree planted by the waters, and that spreadeth out its roots by the river, and shall not see when heat cometh, but its foliage shall be luxuriant; and shall not be anxious in the year of drought, neither shall cease from yielding fruit... Thou hope of Israel, the L-rd! All that forsake Thee shall be ashamed... because they have foresaken the L-rd, the fountain of living waters. Heal me, O L-rd, and I shall be healed; save me, and I shall be saved; for Thou art my praise." What did Jerimiah do with the field he was told to buy? Bryce, you ask what is the point of Jeremiah. In Amos 3 and verse the Lord says, " Surely the Lord Yahweh will do nothing, unless He reveals His secret to His Servants the prophets." The point for Jeremiah's book is that he tried to warn the king dome of the south (in this case Judah) not to the same mistake from the northern king dome (Israel). They needed to abandon the false gods or a big nation would come to take them.